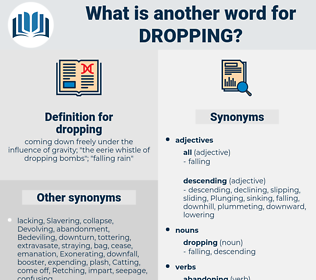 What is another word for dropping? coming down freely under the influence of gravity; " the eerie whistle of dropping bombs"; " falling rain"
stopping, Collapsing, depressing, receding, withdrawing, deteriorating, Discontinuing, diminishing, eroding, recording, sliding, Producing, losing, provide, Ceasing, downsizing, withholding, Ignoring, Overthrowing, Slumping, slipping, disregarding, Excluding, Depriving, Disembarking, descending, drilling, disapplying, Eradicating, dwindling, leaving, Refusing, Delivering, Dismissing, Deposing, disqualifying, Terminating, Canceling, Cancelling, Forfeiting, Suppressing, Resigning, rendering, stupid, lapsing, hanging, rolling, Crumbling, offloading, jumping, Revoking, retiring, spend, Repealing, Throwing, overlooking, Encountering, worsening, Registering, Reversing, wondering, shortening, Devolving, moving, subsiding, Detracting, switching, forgiving, reinstalling, reverting, scrapping, Rejecting, Depositing, Inserting, Avoiding, dumping, Relieving, projecting, dismantling, narrowing, releasing, Addressing, contracting, shooting, purging, locating, Sacrificing, Deviating, detraining, Discounting, Overcoming, softening, writing, Evading, downloading, Referring, minimizing, bombing, turning, posing, Circumventing, reneging, Abolishing, ending, Admitting, Curtailing, Resorting, ousting, unloading, Waiving, Initiating, Skipping, 'sgoing, indulging, scratching, pricing, exiting, wearing, Phasing, Discharging, Obtaining, Embarking, Bridging, failing, positioning, extinguishing, laying, Quitting, engaging, Loosing, Commenting, Escaping, installing, lessening, lightening, Gaining, Lifting, waning, fleeing, yielding, becoming, breaking, curbing, Inflicting, raising, relaxing, closing, going, Replying, Mitigating, ranging, Levelling, sticking, walking, launching, negating, landing, hurling, striking, Earning, Accruing, passing, attacking, wasting, showing, investing, averting, barring, shielding, firing, returning, giving, Attaching, pushing, planting, bring, bringing, cleaning, Quashing, flowing, abating, posting, Placing, setting, Affixing, freeing, Resting, putting, shelling, Effecting, winning, fixing, asking, letting, casting, easing, banging, backing, Amounting, getting, shedding, cutting, name, making, downing, clearing. 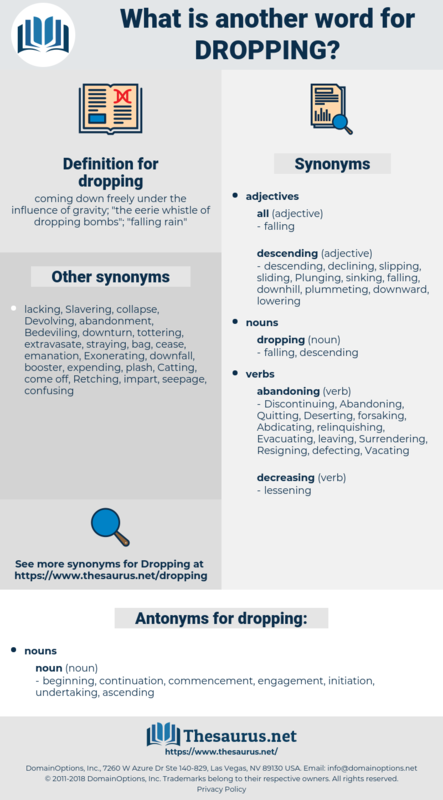 drop, drops, dropped, toppling, downing, clearing. reduction, lower, lowering, plummeting, Abandoning, Surrendering, drifting, reduced, reducing, relinquishing, retreating, Disposing, bypassing, foregoing, Renouncing, Detaching, shrinking, Dispensing, Precluding, Abdicating, Rescinding, sinking, Neglecting, forsaking, aborting, slowing, minimising, Omitting, Alleviating, weakening, Erasing, spilling, Wiping, Bumping, missing, tossing, unleashing, toppling. beginning, continuation, commencement, engagement, initiation, undertaking, ascending. He does not start from his village until the sun is dropping on the morrow. They recalled me, that's true enough, Dodichet replied, dropping into a chair, but I didn't choose to go back; because they wanted to play a low trick on me. driving, drooping, drippings, drippiness, drepanis, drabness, drubbing, dripping, deriving, droppings.